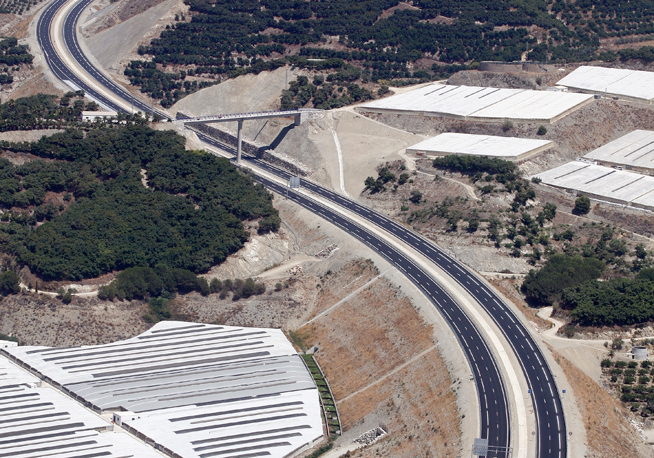 This section of the Mediterranean Highway is a new construction; it has a viaduct located over an important ecological area, three highway overpasses and 10 highway underpasses. 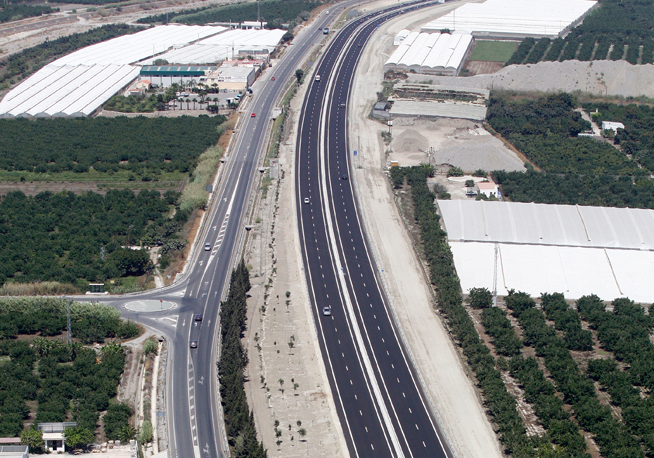 Both highways connect to each other via the Guadalfeo Junction, which is included in the 12-GR-3540 project corresponding to the Lobres-Guadalfeo section of the A-7 Mediterranean Highway. However, this project includes a large part of said Junction as an initial provisional connection. 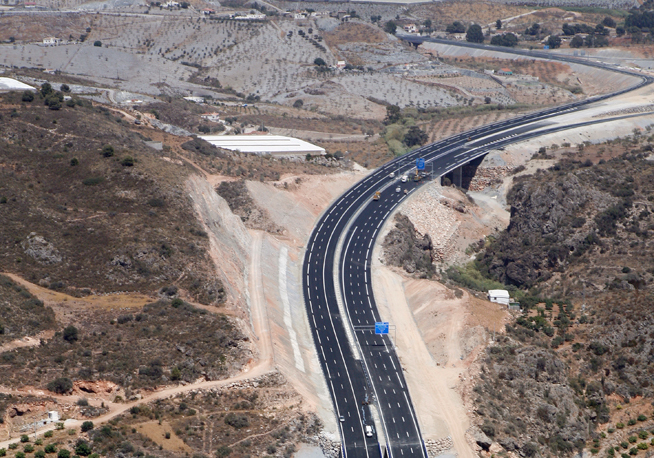 The Guadalfeo Junction is located on the left side of the N-323 National Road leading to Motril, near P.D. 193. 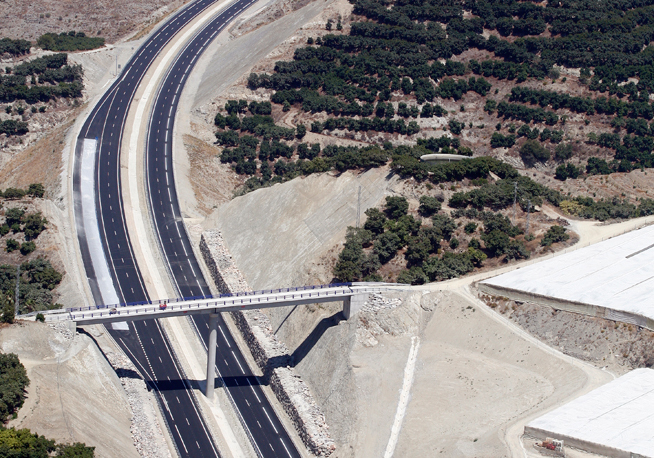 The section of the Mediterranean Highway starts at the Guadalfeo Junction, a point where the highway ascends at a sharp incline. After the first few metres of clearing, it is supported on a large landfill of approximately 500 m, reaching a height of 30 m. The highway continues to be supported on the sides with a series of clearings and landfills until it reaches the height of k.p. 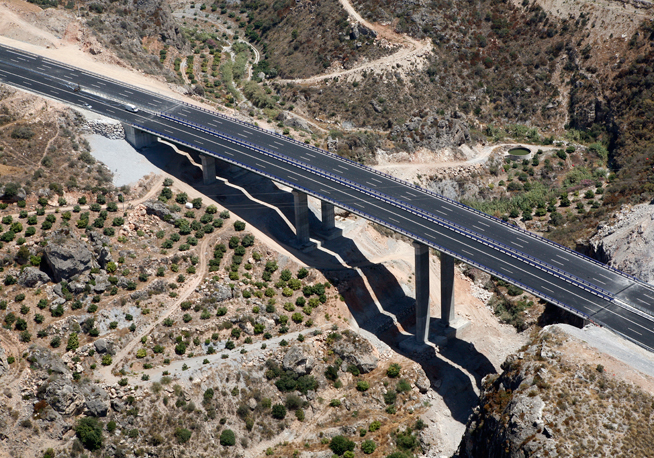 2+760 to the Rambla de Escalante, which it crosses by means of a 220-m long viaduct. The viaduct is unique due to the terrain on which it is located. 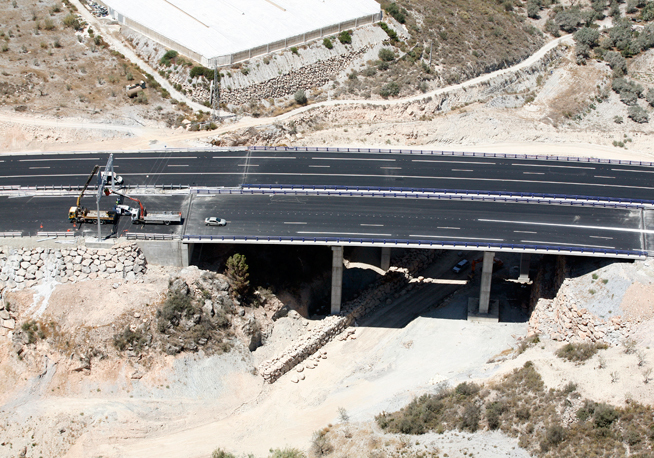 It has four spans of different lengths, the first measuring 75 m. The highway is then supported by the northern slope of the Rambla de Escalate riverbed up to the new intersection near k.p. 3+600, this time with a dome-type cross drainage system. The section of the GR-14 highway, subject of this project, starts at the current junction between national roads N-340 and N-323 at k.p. 329 of the N-340. This junction, formed by a lower roundabout, is modified slightly to adapt the entrance of the N-323 north to its new configuration with separate roadways. 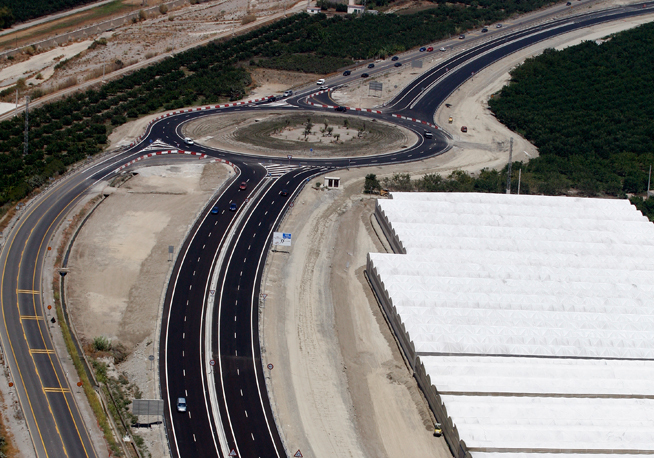 Additionally, the Motril-Granada and Granada-Salobreña sections are separated by direct lanes with right-hand turn curves. In the first case, the lane is physically separated from the ring road. The first curve of the N-323 road at the exit from the roundabout was rectified, increasing the radius up to 460 m for the right-hand carriageway and up to 450 m for the left-hand carriageway. After the curve, the current road remains as the left-hand carriageway, while the right-hand carriageway will be newly built. The separation between both carriageways is four metres wide in most places, increasing occasionally in specific sections. The Lobres intersection is located after the first 1,900 m of road, between roads SO-22 and N-323. This intersection, currently a small roundabout, was modified to adapt it to the new configuration of the N-323. A large-diameter roundabout was designed, with both incorporations from the N-323 and from the SO-22 Highway, as well as two more entries for side roads. At k.p. 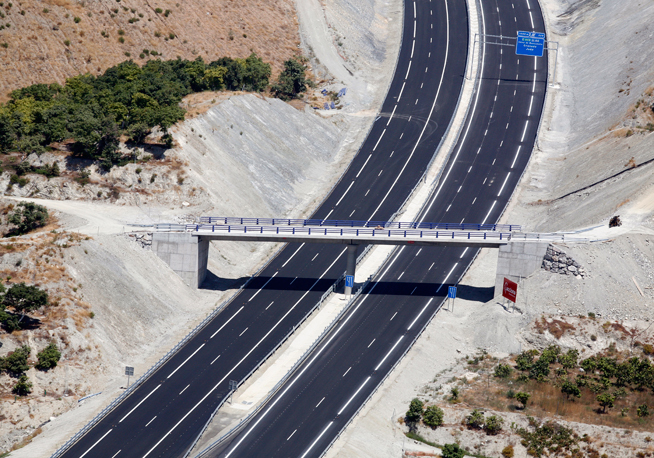 2+900, the existing curve was rectified to rebuild both carriageways anew. The construction ends at k.p. 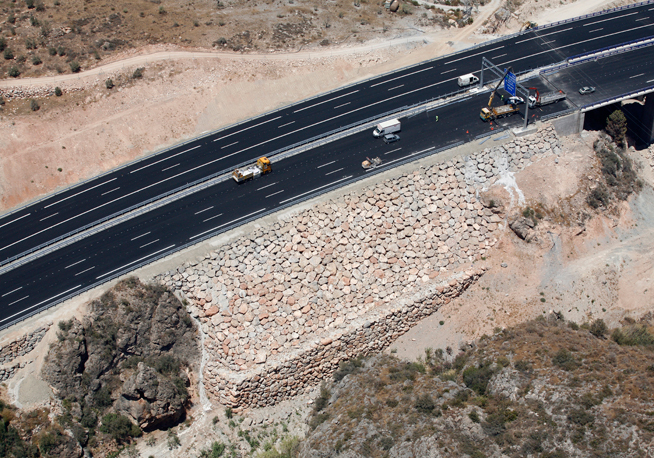 3+104 of the right-hand carriageway and at 3+180 of the left-hand carriageway, where it is connected to the project with code 12-GR-3540, corresponding to the Lobres-Guadalfeo section of the Mediterranean Highway. The volume of earthworks is approximately 2.8 million m3 in clearing, and 2.4 million in earth fill. The graded area is E3 type, whereas the pavement of the highway is comprised of 25 cm of aggregate, 15 cm of G-20 HMA, 7 cm of S-20 HMA and a 3-cm wearing course of M-10 HMA. In addition, a viaduct was built to bypass the Cañizares riverbed. 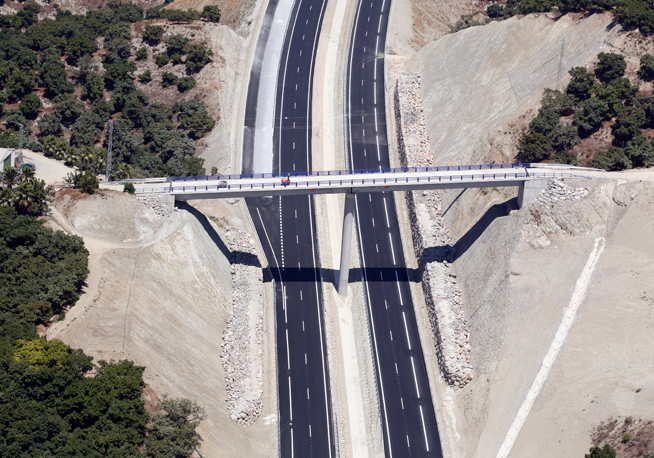 Consisting of two structures, one per carriageway, located on a curve with a 1,300 m radius. Both viaducts have a constructed length of 220 m, formed by spans of 75.00 - 60.00 - 50.00 - 35.00 m respectively. Three highway overpasses and 10 highway underpasses were also designed. In addition, 13 cross drainage works were constructed, as well as road safety works, signage and markings, requiring the construction of several ancillary works: medians, emergency posts, enclosures and traffic diversions. For the execution of the work, it was necessary to divert and replace the affected services: high- and medium-voltage electrical lines, telephone lines, water supply network and irrigation networks made up of tanks, irrigation canals and pipelines. 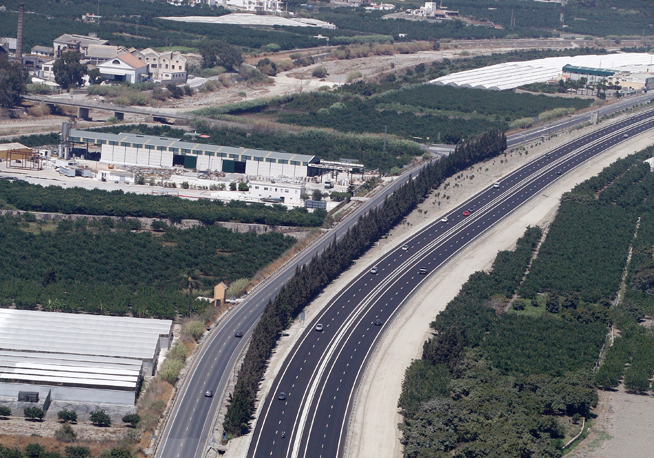 The majority of areas affected by these services are located at the twinning of Highway GR-14 at the Guadalfeo Junction, because this area is near the urban centres of Motril and is also of agricultural use (irrigation crops).